Claudia Fragapane and Ellie Downie both qualified for the all-around final as Great Britain's women set up 10 medal chances at the European Gymnastics Championships in Montpellier, France. GB have a maximum two athletes in all five finals with Becky Downie and Amy Tinkler also qualifying for medal events. "It's my best all-around score ever so I'm over the moon," Ellie Downie, Becky's sister, told BBC Sport. "There's no way I was expecting that." She added: "It was a bit up and down before coming here but I'm really happy." Downie scored 56.19 to qualify in third while multiple Commonwealth champion Fragapane was fifth with 55.031. That total eliminated British champion Tinkler in sixth by just 0.073 points, as only two gymnasts per nation can progress to each final. 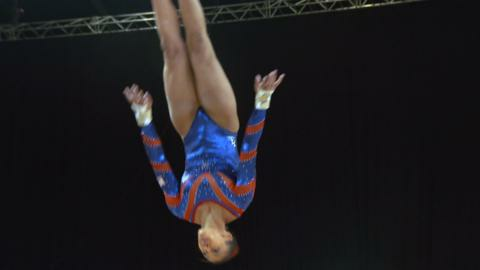 Some 24 gymnasts form the all-around final list while eight compete in each apparatus final. "I really enjoyed it. I just wanted to try to soak up the atmosphere in my first senior Europeans and whatever happens happens," said Ellie Downie. Fragapane, who won four gold medals at last summer's Commonwealth Games, would have scored higher if not for errors on floor and uneven bars. "I'm quite happy overall and just hoping when it comes to the finals I'll do even better," said Fragapane. "I've definitely got more to give. All my stuff can be much cleaner. I'm going to get back into training tomorrow and try to fix those mistakes." Fragapane will also go for apparatus medals in beam, floor and vault, while Ellie Downie will take part in vault and uneven bars. There she will be competing alongside her older sister Becky - who won European gold in that apparatus last year. Becky also qualified for the beam final and Tinkler made it through to the medal routine in the floor. Individual apparatus finals take place over Saturday and Sunday.